Just a quick post today but last week I won the lovely Laura's Big Beauty Bundle Giveaway so today I thought i'd show you what was in it. I can't believe how much Laura spoiled me, the box was jump packed with so many lovely goodies including Soap & Glory, Maybelline, The Body Shop & Estee Lauder to name a few. There was a huge mix of makeup and body bits with a few jewellery items as well. My beloved Peppy Galore Diva moisturiser also appeared in the box too so I was super happy. I just want to say thank you so much to Laura and to congratulate her on reaching 500 followers! I've been reading your blog from the beginning and you deserve everyone of them! Sounds like you won some amazing products! Wow!! 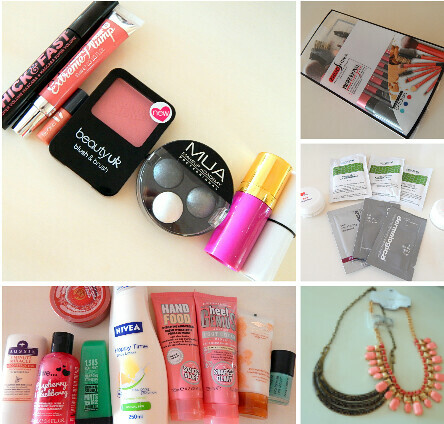 That's a great "Beauty Bundle" prize pack! Lots of stuff to try out :)!